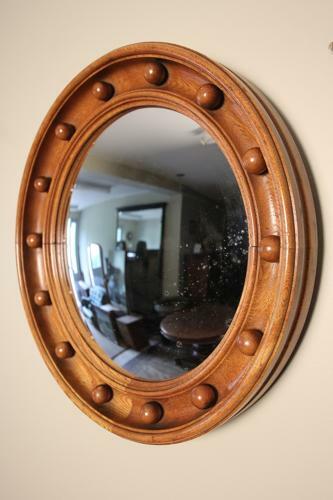 A great example of a Heals of London, 1920's convex mirror, having a moulded golden Oak frame with decorative ball carvings to the surround. The original convex mirror plate with light foxing. Dimensions: Diameter: 47 cm - 18 1/2 Inches, Depth: 5.5 cm - 2 1/4 Inches.